This is a once-in-a-lifetime experience. You will have exclusive, private use of the exotic Arctic dome. You will be all alone at this wonderful place to enjoy a spectacular and memorable night. You can gaze up at the moon, stars or Northern Lights from your bed. Guests staying in the Arctic dome have access to the bathroom, toilet and kitchen inside the house nearby. The price includes linen and towels and access with kitchen facilities. You can cook your own meals or book a package including catering. • Price: NOK 1.200 for 2 persons. 250 NOK extra per person over 2. 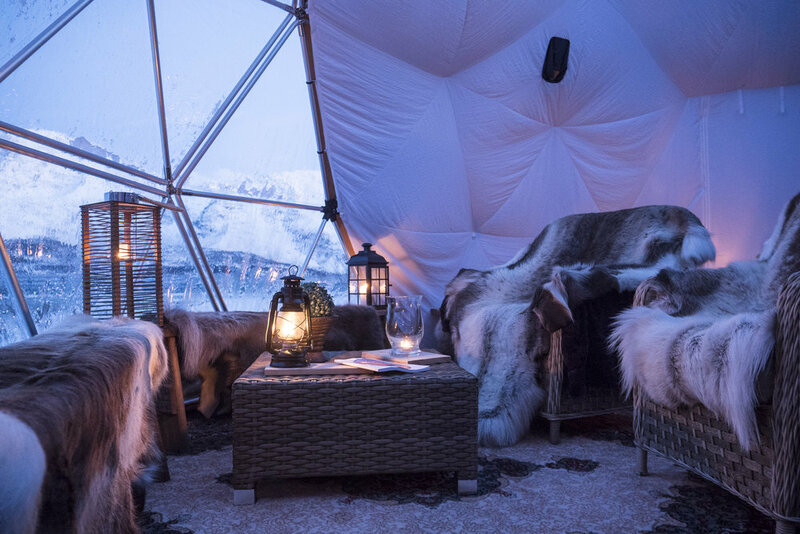 Our guests in the cabin or Arctic dome may hire the hot tub for a fixed fee of NOK 2,000 if the temperature is not too low. The wood-fired hot tub is outside and offers spectacular views. In winter, you can relax in the warm water and gaze up at the Northern Lights dancing in the sky above, while in summer you can enjoy the Midnight Sun from the same spot. You may also book spa treatments before arrival. Feel free to check our spa page.We can arrange transfers from/to Tromsø on request. Please contact us for a quote. Both accommodation options are on a self-catering basis, but we offer packages with catering if booked in advance. Adding delicious meals based on fresh, local produce adds an extra dimension to your adventure. Please contact us for further information.